Announcing the winners of the 12th Right Place Photo Caption Contest of Season Two! Presenting the top 30 captions for this picture from AFP/Getty Images/Chris Hondros via Yahoo! -- "That's right, Bolton... you just got served!" -- "Thank you, thank you! I'll be here all week. Try the anti-Americanism." -- "Graftmaster Kofi iz IN DA HOWWWWWZ!" -- "My title is blurry, just like our financial records." -- "I can too vote twice! I'll be just like my Democrat friends in Chicago!" -- Kofi shows how he would guard Wilt Chamberlain in the Bill Russell Look-Alike Contest. -- "Here! Take Darfur! Just don't hurt me!" -- "You'll need this many more resolutions before we'll agree to an invasion of Iraq." -- Here, we see Mr. Annan surrendering to greed and avarice. 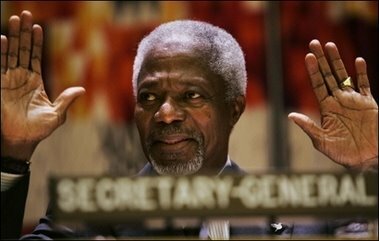 -- Kofi Annan surrenders to the NYPD for thirty years of unpaid parking tickets. -- "Yes, yes, I have the right to remain silent... got it... I've seen all the Law and Order TV episodes..."
-- "Jack Bauer is here? Oh, I never thought it would come to this!" -- Kofi Annan takes his turn leading the U.N. "Terror Response Drill". -- Somebody finally clearly explains the Democrats' position on the war. -- Kofi begins the day with Jacque's "French Calisthenics". -- "Welcome aboard, Congressman Foley, you have excellent credentials to become a UN Peacekeeper." -- "We will surrender on the beaches. We will surrender in the towns. We will surrender wherever the enemy wants us to. We ARE the UN." -- "The Secretary-General recognizes France." -- "Sorry, couldn't take another bribe, I'm full!" #10: Kofi the Mime passes a strongly-unworded resolution against the invisible box. "...No, seriously, somebody from the Syrian delegation just set the roof on fire." #8: "Oil for food kickbacks melt in your mouth, not in your hands." #6: Morgan Freeman's evil twin finally surrenders after a tense stand-off with U.N. Peacekeeping Forces. #4: "On behalf of all the freedom loving peoples of the world, I surrender to our new Muslim Overlords." #3: "Mr. Bolton, is it really necessary to have me frisked on the way out?" #2: "Okay, don't move, Kofi, that's perfect. Finally, we get decent reception on Al-Jazeera!" #1: "One at a time, please... there's enough appeasement for everyone!"